On behalf of Chevrolet, one of the NAHP sponsors for the 2014 Annual Convention, we would like to share the following release. Attached is a photo; you’ll find the photo caption at the end of the release. If you are interested in an interview with Chad Lyons Chavez, Chevrolet Communications Manager, at the conference in Chicago or via phone, please contact Nadia Moya at nmoya@theaxisagency.com or (212) 878 5108. Chevrolet, one of the world’s most iconic car brands, will participate as a sponsor at the National Association of Hispanic Publications (NAHP) Annual Convention and Business Expo to be held September 24-27, 2014 in Oak Brook, Illinois. Chevrolet has a long history of supporting NAHP and its mission as a non-partisan trade organization that advocates for Spanish language publications in the United States. On this occasion, Chevrolet is leveraging the event to increase awareness among Hispanics for the award-winning safety features of its 2015 Silverado and Colorado pick-up trucks. Hispanics represent a priority consumer for Chevrolet. Not only are Hispanics driving new vehicle sales in the U.S., they are also the key consumer segment behind Chevrolet’s brand growth. This is particularly reflected in the sales of the Silverado, Chevrolet’s best-selling truck among Latinos in the United States. Truck safety features can be a key selling point for Latinos, particularly since trucks and SUV’s are among their preferred vehicles. And this is critical because according to the National Highway Traffic Safety Administration (NHTSA), motor vehicle collisions are the leading cause of death for Hispanics. Chevrolet has incorporated many new safety features in both its full and mid-sized trucks. The 2015 Silverado 1500 series crew cab recently received the highest possible 5-star Overall Vehicle Score for safety as part of the National Highway Traffic Safety Administration’s New Car Assessment Program. When they were introduced last year, the Silverado and its sister, the GMC Sierra 1500 series crew cabs became the first pickup trucks to receive this safety distinction since the NCAP program was revised to become more stringent starting with the 2011 model year. And Like Silverado, the 2015 Chevrolet Colorado extensively uses lightweight, high-strength steels, which make the most of the strength, safety and refinement of the truck. Overall, over 71 percent of the Colorado structure is comprised of high- or ultra-high strength steels. In addition to using high-strength steels, Silverado and Colorado offer a full array of segment-exclusive available safety features, including Forward Collision Alert and Lane Departure Warning. In addition, a Safety Alert Seat is available on the Silverado, a patented warning approach that alerts the driver of potential traffic danger using directional vibration pulses from the seat cushion. Chevrolet will display the 2015 Colorado at the NAHP Business Expo, where attendees will have the opportunity to learn more about truck safety and the brand’s unique safety features. 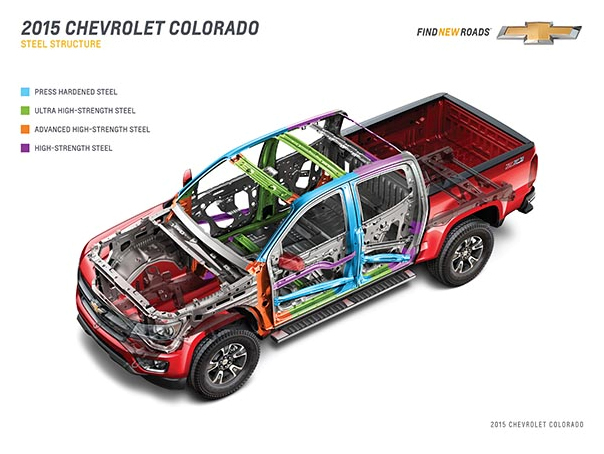 The Chevrolet Colorado makes extensive use of high-strength steels and aluminum to shave pounds from the new midsize truck while preserving true pickup capability.